Hickory Crawdads reliever John Fasola is a broken-bat single away from being a perfect 13-for-13 in save opportunities this season. Yet the native of Hudson, Ohio doesn’t consider himself a closer. Of course, currently sitting at Low-A ball, there is certainly a long way to go before his role is ultimately determined. On numbers alone at college, Fasola might’ve had a point. He worked mostly in middle relief in his lone season at Kent State, where he went 2-2 with three saves and a 4.68 ERA. 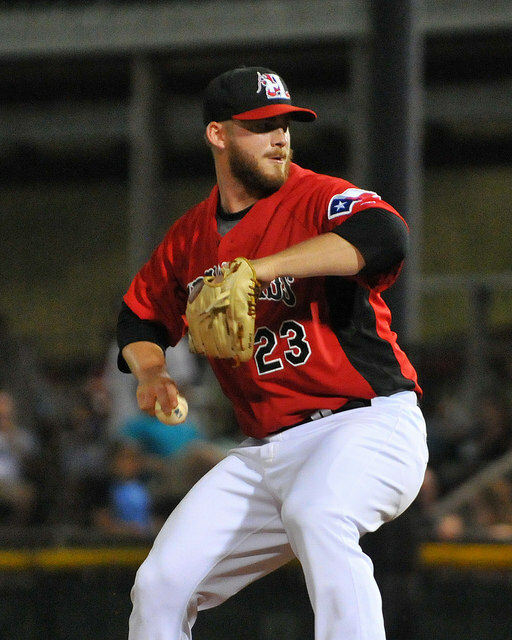 He posted a 28:8 strikeout-to-walk ratio which led the Texas Rangers to make him the 31st-round pick in 2014. Fasola went to short-season Spokane and was among several pitchers that closed out games for the Indians. He posted a team high of five saves and a 2.05 ERA. He also struck out 40 and walked five in 26.1 innings. Bringing a 92-94 mph sinking fastball, occasionally touching up to 96 to go with a slider, at least at this point, Fasola has brought to the table the idea of becoming a crucial bullpen piece, – if not a closer – in the future. This season, he has worked on adding a changeup to his arsenal. With the addition of the pitch, Fasola may yet be used in a variety of roles in the future. In recent weeks, Fasola’s workload has increased. During his last four outings, he has thrown at least two innings each time with three or more innings twice. On June 7 at Lakewood, Fasola recorded a ten-out save that gave the Crawdads a key game in their playoff hunt. While the strikeouts continue to pile up (32 Ks, 3 BBs in 24.1 innings), he has also able to keep hitters on the ground Fasola currently has a 2.45 GO/AO ratio. In the following interview, Fasola talks about his progression this season in the bullpen, as well as his transition to the pro game. Let me go through your season a little bit. You have 11 saves at this point (at the time of the interview on June 11). Were you a closer in college? Fasola: For a little bit, yeah. I was more of a mid-relief setup man and then towards the end I took on a closer role when we made it to the playoffs and the post season. Then in Spokane, I wouldn’t say I was the closer, but I found myself in the back end of the games sometimes – not necessarily in save situations, but just late in the game, seven, eight, nine (innings). I don’t know, it’s just something I happened to fall into. I didn’t really prepare to be a closer or anything like that. I wouldn’t even qualify myself as a closer. I’ve gone three innings my last two outings. So, whenever they need me to pitch, I’ll pitch. I was going to ask you about that. I know the Rome situation (three innings for a win on May 31), it was a matter where the guys breaks his bat and gets a hit and the team was a little thin in the bullpen.Were you surprised to get the next one in Lakewood? That’s a ten-out save that stretched you out a bit, but that was a big pickup at the time for the team? Fasola: I hadn’t thrown in a while. Going into that game, I was told that no matter what the score is today, you’re going to get your work in. At some point when seven days goes by, you know you’ve got to get out on the mound and see some hitters. So, I was told that I was going in that day; so be ready after the fifth. I think it was the sixth inning, I came in with two outs and I got a three-pitch strikeout. Then I had a quick second inning and the next thing I knew, I was throwing in the ninth. I kept my pitch count down and I got a lot of ground balls and I was fortunate enough to close that game out for us. How do you feel like you’ve developed this year? You mentioned that you don’t see yourself as the closer, but you’re probably the closest thing we’ve had as a closer in a while. At this level, you just don’t see that much- a closer. How has that developed for you? Fasola: I think just throwing strikes. Getting to strike one gives you a lot of pitchability. That’s something this year that fortunately I’ve been able to do thus far. Getting to strike one it makes everything easier. You can pitch off your fastball; the hitter really can’t sit on anything. If you get to 0-1, you can throw something in the dirt. You can throw a chase pitch. It just gives you a lot more room to work with. So, this year, I’d say that’s the biggest thing that I’ve gotten better with, just getting the first pitch over the plate. What sort of stuff did you bring to the pros and what have you developed since you’ve been here? Fasola: I was a four-seam, slider guy all the way through high school and then in college. I closed a little but in high school, but I didn’t really pitch; I was a thrower. I got drafted and I just kind of threw everything as hard as I could. This year was the first time I started working on a changeup. That’s what I think I can attribute to me being able to go for three innings that I have the last two outings. Just being able to show something else that’s slower instead of the hitter sitting hard, hard, hard. But if you mix a changeup in it makes your fastball look harder, it makers your slider look sharper. It just gives you a lot more room to pitch in. What are you looking for your changeup to do? Are you looking for it to go a different direction than your slider? What sort of changeup do you throw? Fasola: That was the biggest thing for me going into spring training; I was mixing up all my grips. At instructs last year they told me I needed something soft to compliment my slider and fastball. I mainly just show it and try to throw it for strikes early on in the count and make them respect the fact that I have that pitch, where they’re not sitting on something hard. They have to respect that. I’ve actually thrown it for an off-speed pitch a couple of times to lefties, if I’m ahead in the count. I read in the Rangers media guide that your dad was a professional pitcher for the Pirates organization. Has he talked with you about the pro game and passed on words of wisdom, or has he been hands off and letting you seek your own path? Fasola: He was a catcher, so he knows a little bit about the pitching aspect, because he was a catcher. But his thing was hitting. So when I transitioned over to be a competitive pitcher, he kind of didn’t know that to do and said I can’t you anymore. But he helped me with just being a man and not just baseball stuff. He did his job for me growing up and has just let me find my way in pro ball and kind of let me take the reins. Has he talked to you about the grind of the situation? Fasola: He said: Full season, John, is going to be a grind. It’s a long season. You don’t got to blow it out every day. It’s a grind. You’ve just got to take it one day at a time. You can’t be looking in the future. It seems like a thousand day long season. You’ve just got to take it a day at a time and just be happy to be here. As a pro now in the year since you were drafted, who have you talked to that has helped you make the most sense of doing this job? Fasola: I think going into the draft – where I got my most advice – is my pitching coach from college, Mike Birkbeck (six year major league vet with the Brewers and Mets.) He was a pro player and kind of that whole season leading up to the draft he conducted our practices like professional practices. He’d give you stories, and give you little advice and tidbits. This offseason, I would go back and throw at his facility where he still coaches. He just gave me some tips where he’d say: Do this. Throw this much. Take it easy today – and that type of stuff. Mike Birkbeck has helped me a lot. What does a successful season look like for you? Fasola: Just getting to the playoffs. Clinching the first half so we can get to the playoffs and we can get a ring for the Crawdads. When you get a call to the major leagues, who is that going to mean the most to? Fasola: My dad. My mom and dad, probably more my dad, because he was a professional baseball player. What do you think he’ll do? Fasola: I don’t know. I think he’ll probably shed a tear and then be on the next flight. I’m going to fly him and my mom out and my sisters out, that’s for sure.